Boise Cat Clinic is the most modern, up-to-date, well staffed clinic for your cat. Dr. Roller is exceptionally knowledgeable of all cat problems and treatment. A more compassionate vet cannot be found. 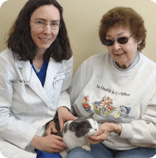 I had the good fortune to meet Dr. Roller during her time at another clinic and she was there for me during the care and ultimate loss of not one, but three beloved cats. During the time period when Dr. Roller was not practicing was truly a loss for me and my cats. Being near 80 years old now, and in the past 30+ years have only taken in abused, neglected, abandoned and damaged cats, having a vet you can count on has been so valued. Thank you Dr. Roller, and caring staff, for this new clinic and always being there for those of us who want the best of care and consideration for our cats and for us as cat owners.